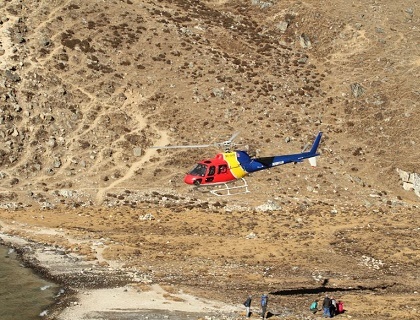 Dominic was evacuated by helicopter from Gokyo Lakes, 4800m. This is how it happened in his own words. I had been feeling quite ill for the last few days. From Khumjung to Gokyo I had vomited a few times, had pains in my stomach etc. It seemed to be gastro, not dissimilar to what James S. had those first few days. However, getting gastro at a higher altitude presented a few more problems. Everybody was already exhausted and my sickness didn’t help. I really wanted to see Gokyo so I continued, having been given the option to turn back to Namche. The second night in Gokyo heart arrhythmia prevented me from sleeping. We made the call to evacuate me via helicopter in the morning. I was sad to leave, knowing that I hadn’t completed the trek, but it was probably the best move to ensure my safety. I was very touched to see that the group had come out to wave to me as the helicopter took off. 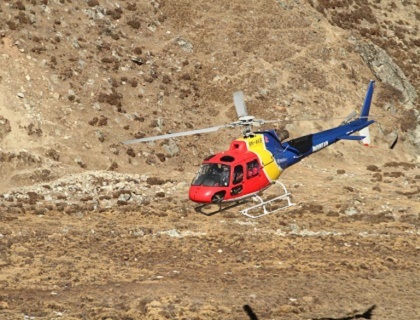 The view from the helicopter was spectacular, and I give thanks to Sue for coming back to Kathmandu with me. My sickness had died down having come back to a lower altitude. Nothing seems to be wrong according to the medical clinic, diagnosing me with altitude sickness. I’m glad to know that this isn’t a permanent problem, but to be sure I’ll have a cardiologist check up on me in Launceston. The next few days Sue and I did some shopping in Thamel, visited the monkey temple and walked abit around the Old Town, a district of Kathmandu that is host to the royal temple and the temple of the living goddess, who poked her head out the window to wave to us. The living goddess is a young girl who is randomly selected by the government and sent to live in a temple, where she is treated as royalty. She has a tutor who teaches her every day and may leave the temple five times throughout the year. She is reentered back into society once she has hit puberty, then another goddess is selected. I find it very strange that such a tradition is still upheld in modern times. It felt surreal waving to an ancient idol of worship and them waving back. 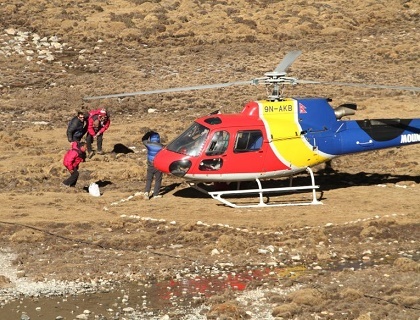 I left for Delhi airport two or three days after arriving back in Kathmandu. I had been deemed fit to fly and departed through Nepal airlines. Thankfully I made my connecting flight to Melbourne, no thanks to the vague staff of the airline. I’ve made it safely back to Launceston and will have my appointment with the cardiologist in early January. While it made things more difficult for everyone, I’m glad I got to Gokyo. It’s probably the highest I’ll go for a few years.